Racing through the streets of Toronto, checking the time, you’re panicked. The Uber took a wrong turn and even though you were sure to leave enough time during your hectic day to make it, you fear you may be late regardless. Anxiety kicks in, and with your head throbbing, you reach for an Advil accompanied by a piece of chocolate from the emergency stash in your purse. The car halts, you jump out and scurry towards the front door of a boutique you found online. The blue and white striped awning elegantly shines in the light of a busy Eglinton Avenue. Delicate bells chime as you swing open the glass doors, and a beautiful scent floats towards you – it’s a mixture of citrus and lilies and you’re instantly calmed. You continue onward, towards the centre of this gorgeous room, overwhelmed by the quality and workmanship of the billowing silk gowns that line the walls. The perfect appliqué of flowing French lace and the glimmer of beautifully beaded bodices surround you. With the ripples of soft silk fabrics draped over pieces of fine French furniture you realize – your headache is almost gone, replaced by visions of Christian Dior himself coming out to greet you. Smiling softly as the tension in your shoulders lifts, finally able to breathe in the bridal perfection that surrounds you – you can’t help but notice the selection of books placed throughout the boutique – featuring almost every couture designer imaginable, all your literary guilty pleasures in one place. Mesmerized by the luxurious bolts of fabrics and the exquisite watercolour sketches hanging on the decadent pastel walls… you wonder, almost as if you’re in a trance, who were the lucky brides to wear these gowns? 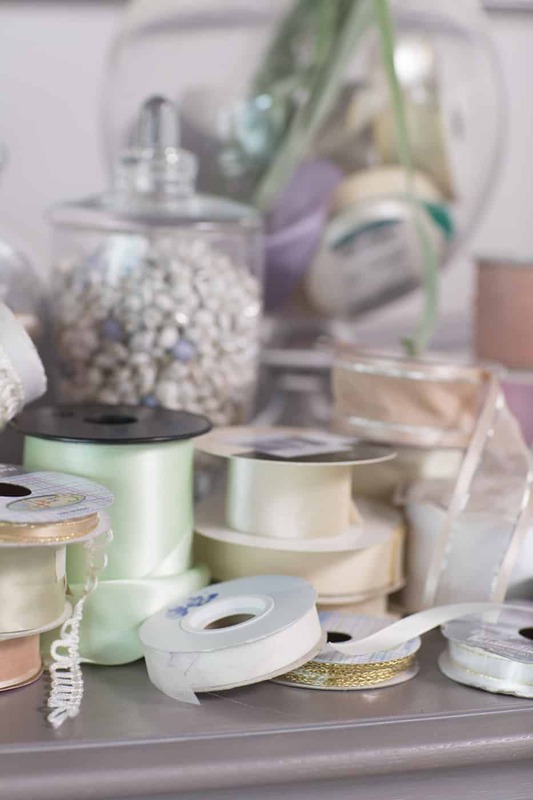 Then, there she is – the visionary behind this gorgeous boutique appears from her workshop and introduces herself as Kim. You’re welcomed into her magical world and both take your seats at a luscious pink marble table to begin. Before the experience starts, you must know, where is this scent from or what is it, exactly? And so, Kim explains, it’s Lilly of the Valley, a flower given to King Charles in the 15th Century to symbolize good luck. Mixed with Bergmagot, an exotic citrus popularized by King Louis XIV, and used to evoke good health and feelings. 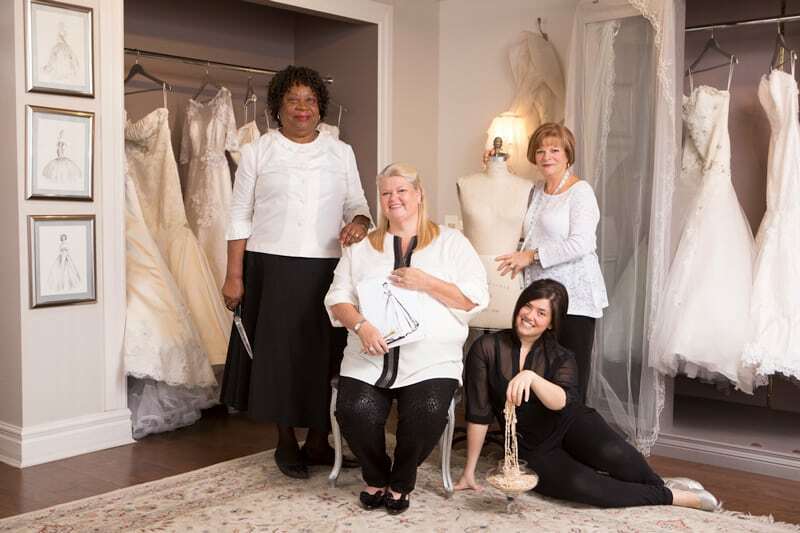 Kim finishes with a wink, good luck, good health and good feelings are all things needed when finding your perfect gown. 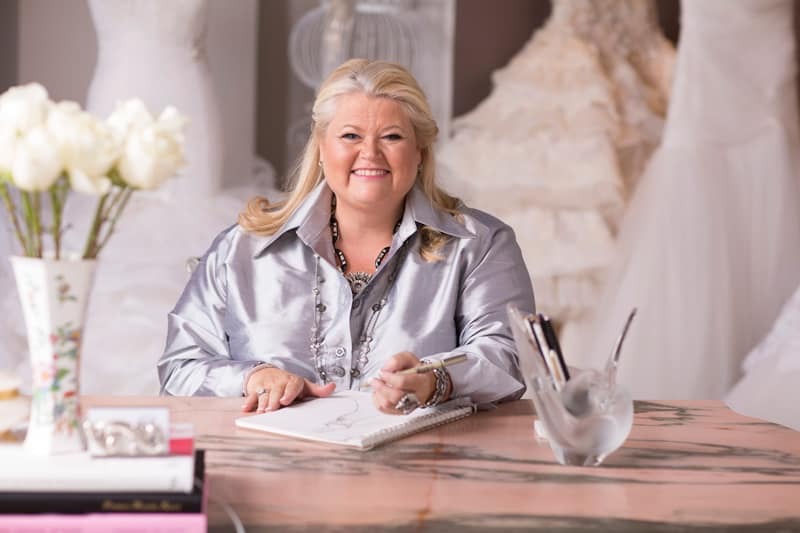 Smiling with ease, the conversation continues, and it becomes truly apparent you’re sitting in front of an artist devoted to crafting extraordinary wedding gowns. Kim’s passion is intoxicating, her eye for detail is impeccable – which you can see easily when she opens her sketchbook and her pencil effortlessly glides swiftly across the page, creating what only can be described as magic. 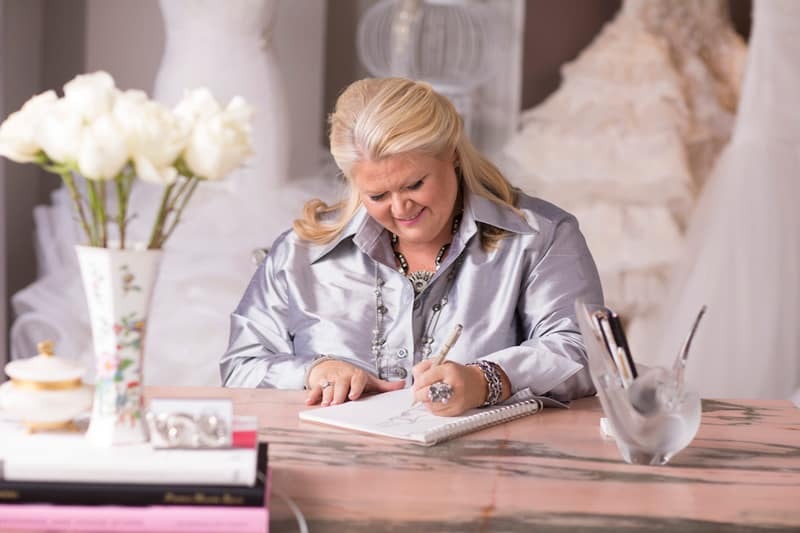 While she sketches, she continues to chat, her quick wit and youthful spirit shines through, as does the 30 plus years of understanding the beautiful craft of wedding gowns. Kim glances over and notices your face in awe, as the gown you’ve been waiting for has majestically appeared, she declares with the confidence of a true couturier, this is where your search ends and our journey creating your dream gown begins. Feelings of relief, excitement and anticipation soar over your body, you can’t wait for the next appointment and pull out your planner to confirm. 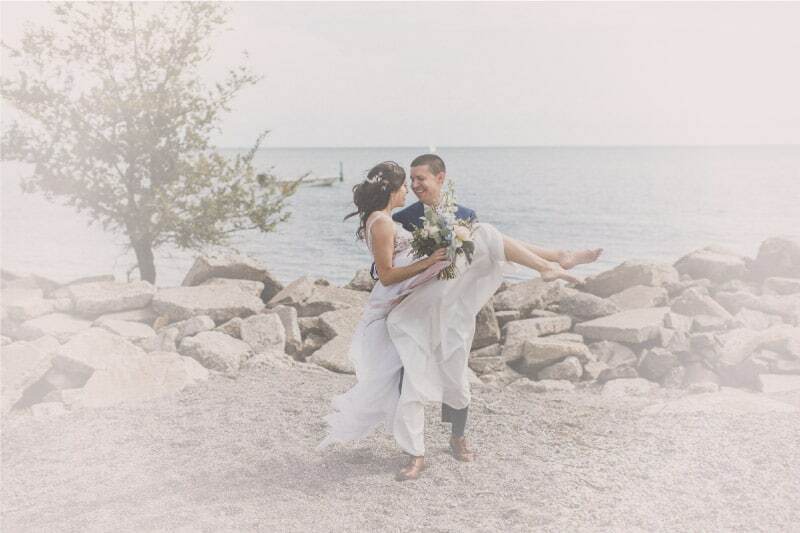 This is it – you’ve found your artist, you’ve found guidance on this journey and you’ve found the gown you will delicately slip into the morning of the day you’ll marry your best friend. And just like that, you’re a Valencienne bride. Ready to embark on the once-in-a-lifetime experience of a meticulously made, bespoke haute couture gown. From a very young age, Kim was drawn toward art and was fascinated with the act of creating something from nothing. In fact, she was most content when she was drawing, painting, working with clay, or sewing. Being involved with working with her hands, she was fulfilled and immensely happy. School years for Kim where difficult. Although she had Dyslexia it did not stop her moving forward, she met this challenge with determination. She excelled in her Art and Geography class and always knew that her career would involve either creating or travelling. During this time, Kim spent all her free time alongside her Aunt who was a purveyor of antiques. She thrived while learning all about the lineage of these special objects such as Lalique glass and the intricacies of delicate gold filigree work and being shown the difference between Battenberg lace and French corded lace. She was immersed in a world of beauty. She started collecting Antique perfume bottles, early edition Vogue Magazines, and Fashion designer coffee table books. She was falling in love with fashion. Kim’s brother was getting married and his fiancé realized that her dream gown could not be found. Kim ended up standing in the centre of a bridal trade show in London, England mesmerized, by a confection of billowing silk wedding gowns and the finery of intricate beaded details. She fell in love with the history and the traditions of marriage. Kim had found her place in the world. It was right then, that the idea for Valencienne was born. On January 15th, 1985, Valencienne opened its doors for business on Bloor St. The boutique was filled with such designers as Bruce Oldfield, Carolina Herrera and David Fielden all incredible mentors for Kim. After 5 years of importing the gowns, Kim still yearned to be a creator. With gratitude and appreciation she said goodbye to her designers and decided to take a leap in faith believing that her creative talent would bring Valencienne into the next chapter of its reign. The foundation of Valencienne has been built on Kim’s undying love of beautiful things, her curiosity of old couture techniques and her need for beautiful craftsmanship. For over 30 years she has perfected her couture standard with each and every gown. She continues to challenge herself knowing that she can be better and do better as a designer. 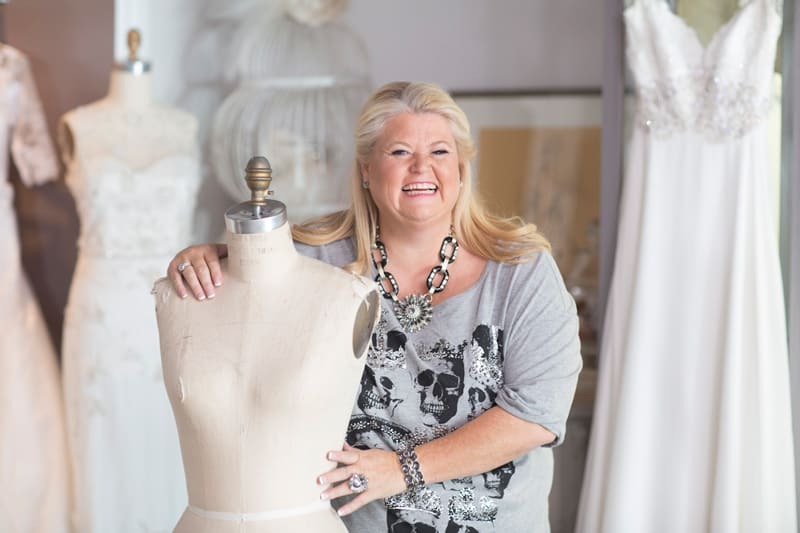 She passionately likes to push the bar and she feels that the most important part of the design process is communication to create a space where a bride is free to really live the reality of her dream dress. It was very important for her to create a world where her brides feel beautiful and look flawless. Valencienne is a place where everyone has a voice and dreams really do come true. She passionately loves to create show-stopping gowns with demure elements. Kim believes in the beauty of women, she feels she has a unique gift which she likes to use to empower brides on one of the most important days of their life. 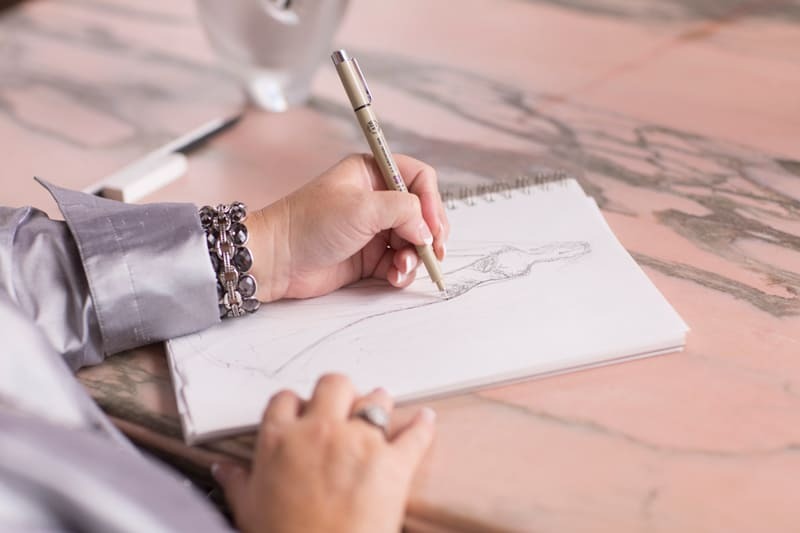 As she lovingly sketches your gown, you will find yourself being asked question you had not even thought about. 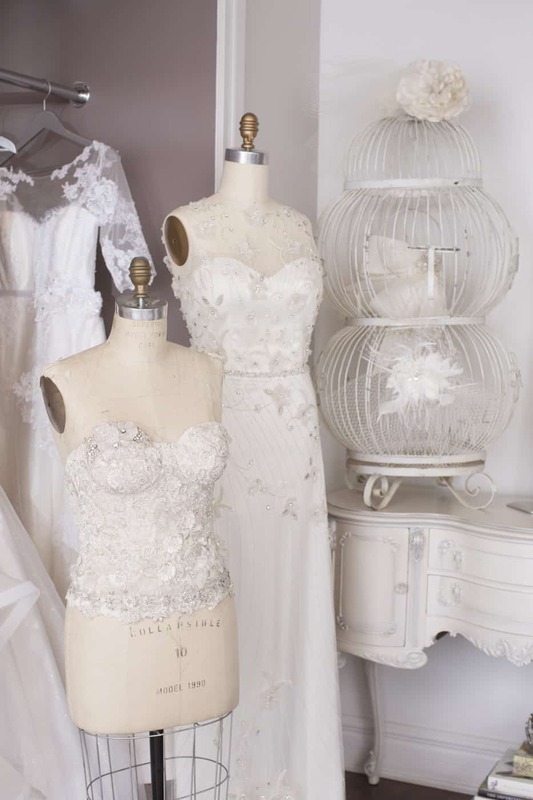 She will honour your unique ideas that you may have thought to be unattainable and together you will discover a gown that will compliment your entire bridal vision. 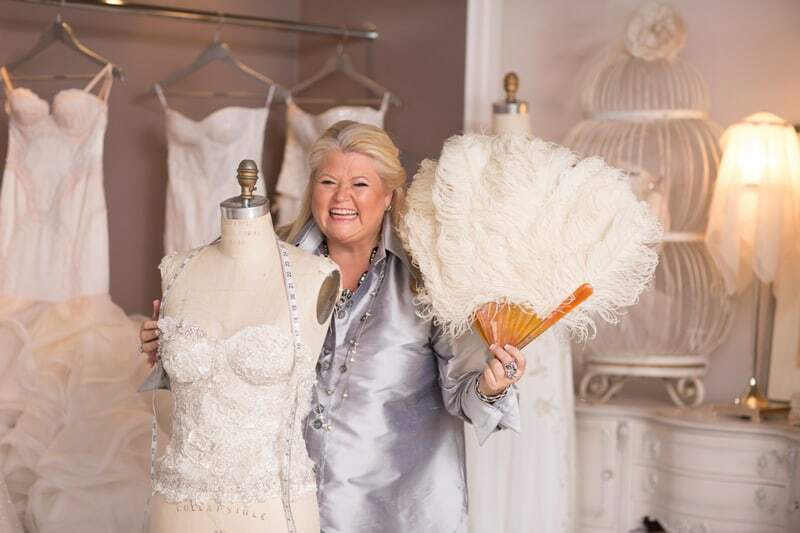 Kim’s outgoing personality and impeccable taste combined with her discerning eye for detail along with her 30 plus years of bridal design ensure that your visit to Valencienne will be a one of a kind experience. 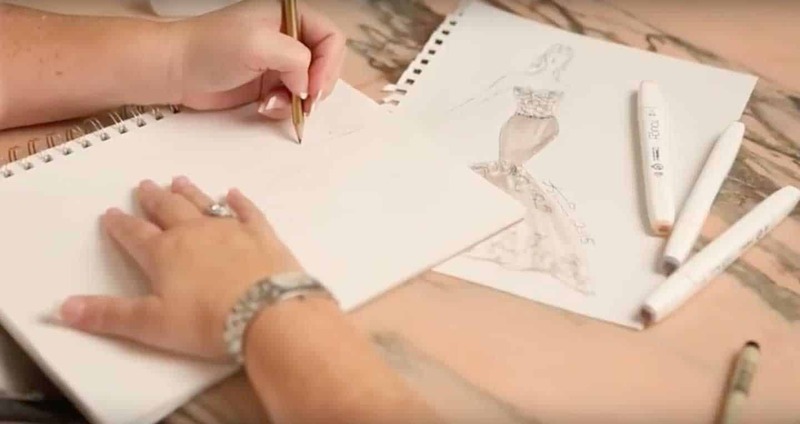 Each and every gown truly is a labour of love; passionately hand crafted a couture piece which will stand the test of time, hopefully being passed on for generation to come. The Valencienne gown is a celebration of the love Kim has for each and every one of her brides, and in its own right is truly a piece of art. I cannot wait to meet you and share this special moment with you and be inspired by you!